Keep your PC protected from Internet threats with a free U3 based anti-spyware and antivirus solution that is always with you. Keep your U3 antivirus with you for ultimate protection. When traveling, ensure your safety and privacy by checking Internet cafe computers for viruses, spyware and keyloggers. Choosing the right one among the many anti-virus products may be confusing and time-consuming. 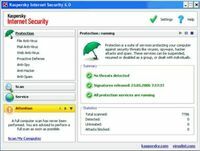 Learning how to set up proper and reliable protection with the tool of your choice can be tricky. The more options you are presented, the more difficult choices and trade-offs between your computer's speed and security you have to make to keep your PC as safe as possible without significantly harming its performance. 1-2-3 Spyware Free by Smart PC Solutions relieves you from making the unclear decisions by offering you the better of two worlds: automatic protection against all known threats combined with ultimate performance while doing so. 1-2-3 Spyware Free detects and removes all kinds of viruses, spyware, Trojan and harmful components that might sneak into your PC during the regular task of browsing the Internet. 1-2-3 Spyware Free runs from a dedicated USB Flash Drive, making it impossible for malicious programs to infect or disable the antivirus. Get free updates over the Internet to ensure you are protected against future threats. 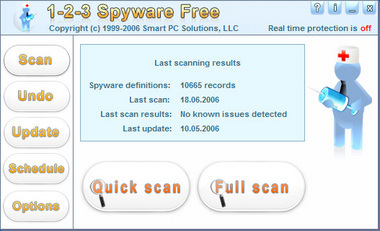 1-2-3 Spyware Free downloads all updates automatically on a schedule, providing completely transparent and unattended operation that is often missed in more sophisticated and much more expensive products. 1-2-3 Spyware Free is easy and safe to use. Real-time protection notifies you about any suspicious activities that a malicious program may attempt, and allows you to block hazardous activities to prevent infection. Scheduled system scan and updates maintain security on regular basis. The Undo option provides you with ability to roll back any infected entries that were deleted.